Brodog Hideaway in Fishguard, Pembrokeshire sleeps 3 people. Brodog Hideaway in Fishguard is centrally located within the historic harbour town of Fishguard and a stone’s throw from the village of Goodwick on the superb north Pembrokeshire coastline. 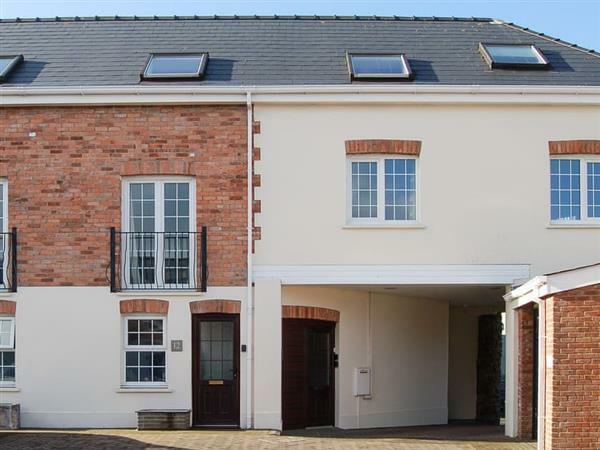 The semi-detached property is set within a mews style courtyard of similar properties with a large communal area. Set over three floors, the property has a bright and airy living room that has been lovingly furnished, and is perfect to relax in after a busy day’s sightseeing. The spacious kitchen, with open plan dining area, is perfect for cooking that special meal. On the second floor is a family bathroom and two spacious bedrooms which have been thoughtfully decorated throughout and offer a great space for a good night’s sleep. Fishguard offers most amenities and the property is within walking distance of restaurants, bars, boutique and craft shops and many water sports in the harbour. The Pembrokeshire Coastal Path is 5 minutes’ walk away, and Brodog Hideaway is situated midway between St David’s, the famous, smallest city of West Wales, and the market town of Cardigan. At St David’s you can visit the magnificent cathedral and Bishops’ Palace. You can even enjoy some locally sourced produce in the restaurant within these stunning grounds. Be sure to browse the plethora of craft and gift shops or take a boat trip around Ramsey, Skomer and Grassholm Islands with a vast array of wildlife to be seen. Travel north to Cardigan where you can visit the castle with 900 years of history waiting to be discovered. Be sure also to catch the farmers’ market here to get some local delicacies. Travelling along the coastline don’t miss Newport Sands, Abercastle and Abereiddy which offer wonderful seaside coves, beaches and some fantastic scenery. A great day out is to the famous walled town of Tenby complete with its award winning beach, cobbled streets and picturesque harbour. Or you may prefer Folly Farm Zoo and Oakwood, Wales’ largest theme park for those thrill seekers. For exploring further afield, the train station and the ferry port, offering services to Ireland, are located only 1½ miles away. There is a beach 1 mile from Brodog Hideaway in Fishguard. With the shop 100 yards, and the pub & restaurant is 500 yards from Brodog Hideaway. Entrance hall: With storage for boots. Bedroom 1: With king-size bed, 24 Freeview TV, DVD player and CD player. Gas central heating (underfloor in bathroom), gas, electricity, bed linen, towels and Wi-Fi included. Welcome pack. Courtyard (shared with other properties on-site). Private parking for 1 car. No smoking. Holidays at Brodog Hideaway run from Friday to Friday. For a better idea of where Brodog Hideaway is, you can see Brodog Hideaway on the map below. Brodog Hideaway is in Dyfed; should you be on the lookout for a special offer, you can find all the special offers in Dyfed. It's always worth checking to see what is on offer at the moment. Do you want to holiday near Brodog Hideaway (UK10649), you can see other cottages within 25 miles of Brodog Hideaway; have a look to find your perfect holiday location.